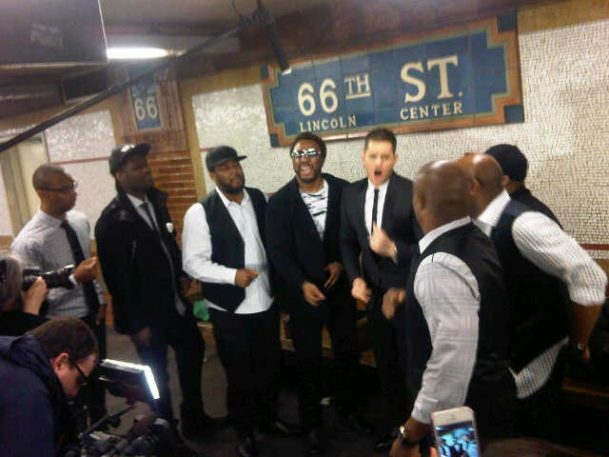 An impromptu performance of ‘Who’s Lovin’ You‘ with Michael Bublé at 66th Street – Lincoln Center this morning. This entry was posted in News, Videos and tagged Michael Bublé, NYC Subway, Who's Lovin' You. Bookmark the permalink. fantastic. Just love this video. I put it on my iphone so I can watch it over and over. Also looks like you had fun on Kelly and Michael. Michael Strahan seemed genuinely thrilled to meet all of you guys and I am sure the feeling was mutual. keep on going guys, you are truly amazing. Fantastic! Any chance you’ll repeat the performance on the tube when you come to London?